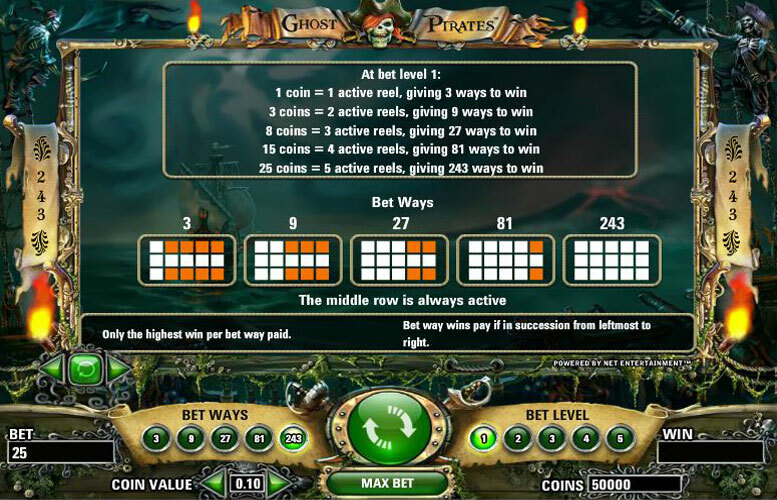 The Ghost Pirates slot machine plays across 5 reels and at max bet level 243 ways. This means all line combinations are covered and you’ll never miss a winning spin again. The return to player percentage is 96.8%. Take it for a spin and win big cash payouts and free spins aplenty, arrragh! 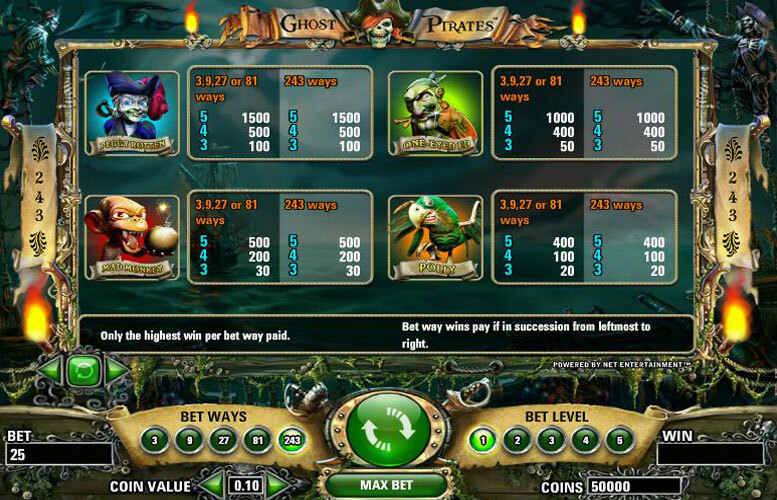 If you are an enthusiast of fictitious stories and adventures then Ghost pirates is the perfect video slot game for you. Ghost Pirates offers a unique composition of features that are interesting and definitely captivating. There’s a scatter, the Chest, which activates free spin rounds where winnings are tripled and there’s a wild which subs in for any other to aid winning combo’s. 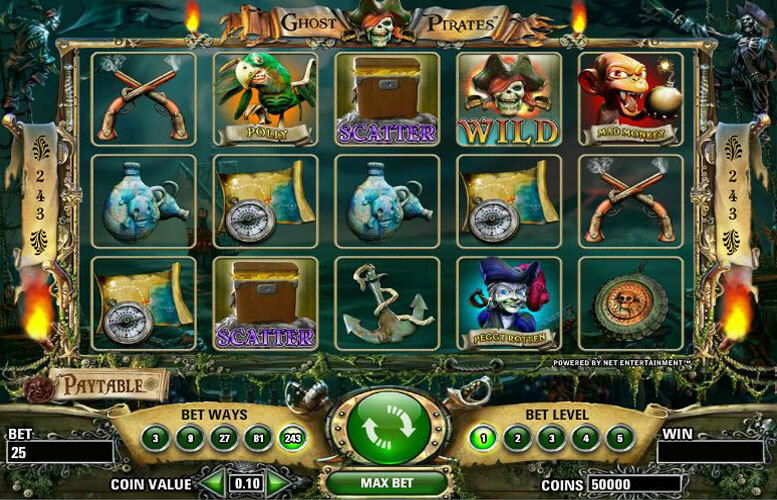 Playing this slot game is not at all difficult and with the ghastly trolls and the obnoxious skeleton backdrop, you’re going to feel as if you’ve stepped aboard a pirate ship not dissimilar to that you would expect to see Jack Sparrow aboard. Animation is swift so no lags will be experienced while playing the game and we’re confident it’s one you’ll enjoy. This 5-reel game has the ability to provide a maximum jackpot of 10,000 coins which is obtained by triggering, and getting lucky, during the free spins feature. When it comes to the regular symbols it’s the Peggy Rotten to look out for as it rewards 1,500 coins for 5 on the spin. The second highest payout is of 1,000 coins and comes from One-Eyed Ed. It’s important to note that when you play Ghost Pirates your playing ways not paylines and the amount you select can and will affect the amount you can win overall. The bet range per way is from 0.01 to 0.50 and there are 5 different bet levels to select from. You can choose between 3, 9, 27, 81, and 243 different bet ways making the maximum amount possible to bet 62.50 and the minimum amount per spin just 1. The wild is a ghost pirate wearing an eye patch and its significance is that of a substitute symbol. If a winning combination is missing another symbol, then the appearance of the Ghost Pirate will help you win the combination. The treasure chest is the scatter of Ghost Pirates and with more than three appearances of this, you can activate the bonus round. While playing the free spin bonus round, if 3 or more treasure chest appears again then extra 15, 20 or 25 free spins are awarded. If you are playing the maximum number of ways, 243, then you’ll get 25, 20 or 15 free spins with the Scatter. If you play any less then it’s 20, 15 or 10. Peggy rotten and One-eyed Ed will help you win the jackpot of 1,500 and 1,000 respectively. 4 or 3 of Peggy Rottens mean 500 and 100 coins are won. On the other hand, 4 or 3 One-eyed Ed’s result in 400 or 50 extra coins. 5 of the Mad money icons reward 500 coins, 4 give 200 and 3 30 coins. The occurrence of 5, 4 or 3 Polly icons reward 400, 100 and 20 coins respectively. Pirate musket: if 5 are displayed the player gets 200 coins, 80 for 4 and 12 coins for 3. The pirate necklace awards 150 coins for 5, 40 for 4 and 12 for 3. Pirates’ map and pirate rum will help the player get 100, 25 and 6 extra coins for securing each 5, 4 or 3. The pirate cannon and the anchor provide extra 80, 25 or 6 coins when 5, 4 or 3 appear respectively.